YuppTV Blog: Why Web Originals are earning more popularity among Viewers? Why Web Originals are earning more popularity among Viewers? Web Originals or Web Series have been prevalent since the late 90s but entered the spotlight after the 2000s. Today, each and every global network out there is producing content and releasing them as Web Series. Netflix, the Global pioneer of internet content is churning out hit web series since 2013. The Network’s original web series House of Cards, Hemlock Grave, etc., have earned nominations in Primetime Emmy Awards too. The fever has spread to India that has been catching up on to net content recently. Ekta Kapoor’s production house Alt Balaji has come up with some of the best web series in 2017. Reputed high priced actors from famous production houses and channels are now lining up to make web series with the various production house, given the reputation of the content that has already been released. 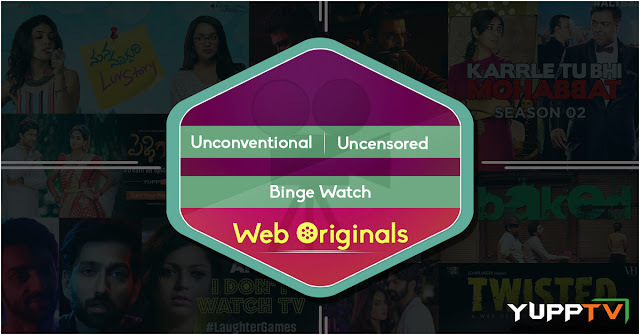 Alongside Alt Balaji, several Indian content providers like ScoopWhoop, TVF, AIB, etc., have jumped in to utilize the privileges and have been producing web originals with versatile concepts that are highly relatable to youth. Some of the regional content providers too have been teaming up with various production houses to create quality web series in Telugu. Web series like Mana Mugguri Love Story, 703, Muddapappu Avakai, Pilla, Social, Pelli Gola, Hey Krishna etc., have earned a certain level of reputation among the Telugu audience worldwide. One reason why web series are earning a prominence worldwide is that they are not bound by any censorship or geographical restriction which makes it available to all kinds of audience in the whole world. The freedom to create anything without interruption from the government or any other organization in the present day of restrictions and is the key point alluring the creators and the actors towards these. Another reason is the availability of the content. Web Series though are in episode format are made available to the users in one go. That means users don’t have to wait an entire week for another episode or an entire year for another season. This readiness is fully in tune with the fast-going generation of ours. This factor combined with the accessibility of the content through any internet enabled device and from anywhere with a decent internet connection is putting web series on the front end of the entertainment sector. Of the many Indian web originals available on the internet, YuppTV has its share in the creation of some. Series from the house of YuppTV Originals like Endukila, Mana Mugguri Love Story, Hey Krishna, etc., are familiar to the Telugu audience everywhere. YuppTV also features some of the series from other houses like 703, Social, AISHA, Pilla, Diet Cheaters, Muddapappu Avakai, etc., in YuppFlix, YuppTV’s archive of movies and TV shows online. Check them out and watch some of the best Telugu, Hindi and Tamil Web Series.